Hi Folks! Del Reynolds here with A Better Roof For Less! It’s the middle of February, 2014 and I just finished up doing some maintenance on our disposal trailer. It takes some abuse throughout the roofing season so it’s critical that we maintain our equipment to get the most use and therefore value out of our investment. And that got me thinking about roofing maintenance and what that means for the home or business owner. So what is roof maintenance and why is it important that we do it? Simply put, roof maintenance is the periodic approach to the prevention of premature shingle or roofing system failure, and that allows you to recoup the maximum value and use of your roof and roofing investment. “So,…what does roofing maintenance entail?” you might ask. Well if You’ve ever cleared the debris from your gutters, thats roof maintenance; and while that is an important aspect of a good roof maintenance plan, it’s necessary to go a few steps further to garner the full benefit, and we like to call that the ABC’s of Roof Maintenance. Annually- You want to clean your gutters and downspouts of any debris that may obstruct the drainage path. Verify that the gutter is securely fastened to the building and is correctly sloped towards the downspouts to ensure proper drainage. Make sure that the downspouts are intact and properly connected to one another, and that the bottom of the downspout extends away from the building a minimum of three (3) feet to avoid wet basements and damaged foundations. Also, give your roof system a good once over and see if anything looks out of place or is obviously leaking or damaged. Biennially- Or ’bout every two years. Keep in mind that the trees and vegetation of your landscape can have a significant impact on the longevity of your roof system and should be kept trimmed back a minimum of five (5) feet from your building. Allowing trees, vines and other plants and vegetation to flourish uninhibited around the perimeter of your home, garage or other buildings not only invites damages due to abrasions, dislodgement and punctures, but also introduces a direct pathway for insects and critters that can damage the roof system and enter your building such as carpenter ants and raccoons. Also be aware of any tree debris that may accumulate on the roof. 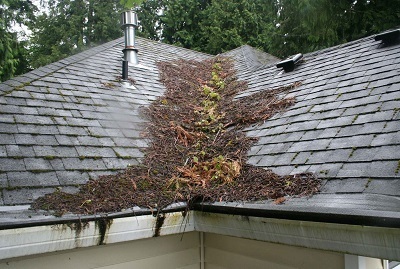 A lot of times it’s obvious, but depending on the style or design of your building it may not be so apparent that tree limbs, leaves, pine needles or seeds may have clogged a valley or is impeding a drainage path on your roof. Continuously- It doesn’t take long for a breach in your roof system to cause extensive damages to your building, so continuous monitoring is required to limit your exposure to the expenses associated not only with normal wear but also weather related events such as high wind, hailstorms and ice & snow. Be mindful of the amounts of ice and snow that builds up on your roof and gutters, as excessive amounts can lead to ice damming and in severe cases even collapse, so should be removed. Also be aware of the amounts of shingle granules collecting in your gutters and at the bottom of your downspouts. While some granule loss is normal and expected, an extensive amount suggests your roof has sustained damage or is nearing the end of it’s useful life. And finally, pay attention while mowing the lawn for any shingle or flashing pieces laying in your or your neighbors yard, especially after any storms or high wind events. These indicate an obvious breach in your roof and should be fully investigated to discover to what extent. Think about having a licensed and insured professional provide their opinion after any high wind or hailstorm comes through your neighborhood. Often times a minimal amount of repair work is all that is required after such a storm to bring your home back up to speed. But if storms were severe enough to cause major damage, it warrants getting your insurance company involved and submitting a claim for full roofing replacement. Again, these are things your roofing professional should be able to help you with. A annually- Clean your gutters and downspouts and ensure proper roof drainage, make sure they are secure and extending away from the building ; Visually inspect the roof and surrounding areas of the building for any signs of obvious leaks or damage. B biennially- Inspect the roof for an abundance of tree debris, also be on the lookout for any damages that could have occurred due to falling tree limbs or overgrown trees or vegetation. Keep everything trimmed back to deter insects and critters. C continuously- Monitor the health of your roof by being aware of how the changes in seasons and severity of the weather can impact your roof. Be alert to the tell tale signs of roof failure including shingles in the yard and excessive granules in the gutters. Maintaining your roof is vital to the soundness of your building and spending a little time periodically will help extend the life of your roofing system and your investment. You should consider contacting a licensed and insured roofing professional if you’re unfamiliar with the tools, equipment and techniques necessary to safely perform roofing maintenance or roofing inspections.